Dubai's police chief says travelers suspected of being Israeli will not be allowed into the United Arab Emirates even if they arrive with alternative passports. Lt. Gen. Dahi Khalfan Tamim says the move comes after the killing of a Hamas operative in Dubai, blamed by the Emirates authorities on Israel's Mossad intelligence agency. 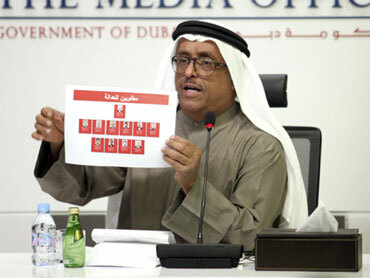 Dubai police say a 26-member hit team carrying forged foreign passports, including British, French and Australian ones, killed Mahmoud al-Mabhouh in his hotel room in January. At least seven of the suspected killers share names with Israeli citizens, further fueling suspicions the Mossad was behind the hit. Israel has maintained a policy of ambiguity on the killing, neither confirming or denying involvement. The Emirates will now "deny entry to anyone suspected of having Israeli citizenship," Tamim said at a security conference in Abu Dhabi Monday. It was unclear if the measure would apply to Israeli athletes competing in international sports events being held there. On Sunday Dubai police said forensic tests show Mabhouh drugged with a fast-acting muscle relaxant and then suffocated with a pillow. Meanwhile, Lebanon's militant Hezbollah group has beefed up security measures following January's killing, and openly asked Lebanese authorities to tighten border controls against would-be assassins. "We call upon Lebanese security agencies to follow and monitor any person carrying a European passport and to deal with him as a potential spy," Hezbollah legislator Nawaf al-Moussawi said in a televised interview Monday. Lebanon is in a state of war with Israel, and Israeli citizens and travelers with Israeli stamps on their passports are not allowed to enter. Hezbollah, which has fought Israeli forces since the early 1980s, has had several of its top members killed, allegedly by the Israelis and in 2006, the group fought a 34-day against Israel. While a powerful force in the country, Hezbollah does not control the nation's borders, airport and ports, and must rely on the government. A government security official said that new measures had already been taken to guard against possible infiltration by Israelis using forged European passports, though he did not elaborate any further. A Hezbollah official, for his part, said that while the group had complete confidence in government security agencies, it has boosted its own security measures as well. Both officials spoke on condition of anonymity because of the sensitivity of the subject.